Affectionately referred to as 'Love Shack' - Free Wifi! Sweet Retreat is perfect if you are looking for a quiet and private get-a-way. The kitchen is fully stocked for everything you may need to cook with. The living room has a cute love seat (with 2 recliners built in) and oversized log chair that sits right in front of the gas fireplace for you to enjoy in the cooler months. The 42" flat screen is above the fireplace and perfectly located so you can enjoy throughout all of first floor, by lying in the comfortable queen size log bed (with feather topper) you can enjoy a movie or just watch some TV. Upstairs you have a full size private bath. The kitchen area has a table and chairs. Right off the living room you can go outside onto the upper deck and enjoy the view of Mt. Yonah. Grill out on the gas grill. Patio seating for 4 is provided on the upper deck, plus rockers. Sweet Retreat is a heavily wooded lot with plenty of privacy. Once you go downstairs you will see an amazing comfortable king size bed with feather topper. Once you get in bed you will never want to get out. Enjoy our electric fireplace mounted beside the bed. You also have a large flat screen TV mounted on the wall. While in bed you'll see the view of Mt Yonah. There is also a full bath down stairs for your convenience. If this has not convinced you to book your reservations yes, then how does a wonderful hot tub on the private patio overlooking the amazing views sound? There is also a pool table downstairs if you like to have a little fun while staying in. On the oversized front porch you can enjoy the gas fire pit while sipping a glass of wine, cup of coffee or sharing stories. When finished, simply turn it off and go about your day or evening. Keep in mind the many places to see and activities offered in Helen that are close by. A few places to visit while you are in Helen is Sautee Nacoochee and when you are here make sure you stop by the Old Sautee Store, built in 1873. The entrance is like a museum and everything remains in the store as it was when it closed down in the early 1900's. Travel the Georgia Wine Hwy. Take in the Gold Rush town of Dahlonega with just about a 30 minute drive. Of course, Anna Ruby Falls and Unicoi State park are just a 10 miles drive or so to the North side of Helen. There are many water falls in the area including one called Dry Falls, just inside the N.C line. This one is unique in that you can walk behind the waterfall under the rock overhang. Beautiful site! Take time to visit Smithgall Woods and Tallulah Gorge and walk across the swing bridge. Brasstown Bald is the highest point in Georgia. Beautiful! This property is about 7 miles from the city of Helen. More, now than ever before, I really appreciate the cool nights in the N. Georgia Mtns and large shade trees. Not terribly far from Atlanta, but it feels worlds apart. It always makes us slow down a bit and just enjoy life when we travel to the area. Refreshing. While we are staying in our cabin, we always enjoy hiking up to Anna Ruby Falls and walk to the top. It's so close by and it's a great way to start our morning. Occasionally, we'll take day trips to Tallulah Falls and go on into N. Carolina to Dry Falls, Bridal Vail Falls and many more along the way. We are also close to Brasstown Bald and Clingman's Dome. There is just so much to visit and enjoy, you have to remember not to book your time too full, so you can just relax and enjoy the quiet times. The driveway is a circular drive, easy to get in and out of. Sweet Retreat was a sweet find! This little cabin is in a perfect location for visiting both Helen and Cleveland. We spent three three lovely days enjoying the wooded atmosphere, hot tub, pool table, fire pit, porch swing and "beary"cute decor! The owners have thought of anything and everything a renter could want. We will definitely stay at the Sweet Retreat again. The stay was amazing. The cabin was beautiful. Hot tube worked fine. Only issue I had was the upstairs backdoor to the patio. My opinion it should have a curtain since the bed is right in view. But besides that overall the place is amazing beautiful view. Will most definitely be renting this cabin again. After reading all the reviews, I had high expectations...and this little cozy cabin lived up to all of them. While there was a small living space, all the furniture was placed in such a way that you never felt cramped. The porches offered amble space to roam around too. The cabin was neat and tidy and I never saw any bugs :) We loved the pool table as it gave us something to do when it rained outside, everything is so thoughtful! 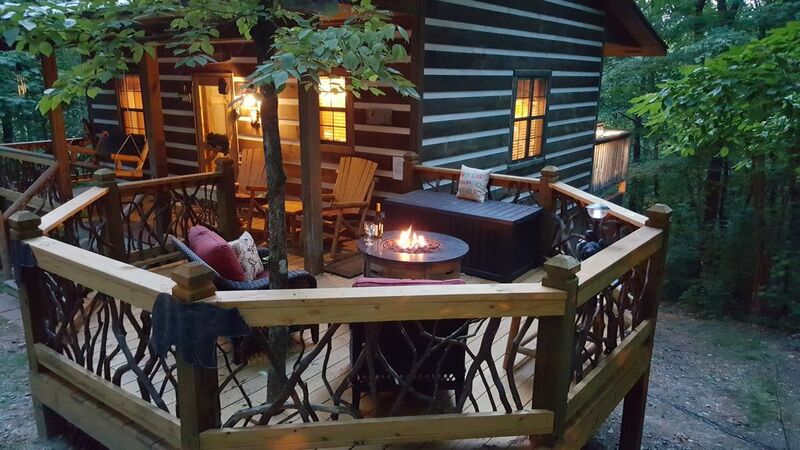 My husband and I celebrated our 2nd anniversary at the Sweet Retreat Cabin. It was very clean and super nice. As soon as we walked in we felt comfortable and relaxed. Patty and her staff really goes out of the way to make sure you have everything you need in case you forgot to pack something. I thought that was a really great idea. I absolutely loved the hot tub. That was probably my favorite part besides sitting outside by the fire pit. We can’t wait to visit again. Made our Spring so SWEET indeed! Had an absolutely FANTASTIC time! Cabin left nothing to be desired, everything was spotless, communication with owners before, during and after stay was always excellent. Their attention to detail was better than a 5 star hotel! Very well located so you can tour the amenities in the area. Very private and very well maintained. Instructions are easily visible for all the cabin amenities. I cannot speak highly enough of our hosts! Thank you!! We will be sending our friends your way soon! The cabin was very clean and organized upon arrival. We enjoyed the hot tub and pool table. We spent most of our time in Helen but the time spent here was greatly enjoyed. SECURITY DEPOSIT - $25.00 purchases property damage protection and is non refundable. Rates are subject to change without notice Check in time is 3:00 pm and check out is at 10:00 a.m. This is not a pet friendly cabin Fireplaces inside is operations for Fall and Winter Months only!! Outside fire pit is for use all year.